The Faculty Lounge: The Future of the Reparations Movement? But perhaps--and I'm really tentative about this--the reparations movement is shifting dramatically. Look; it's no secret that the movement is challenged politically--(only a small percentage of white people are in favor of "reparations" for slavery--by which they mean huge cash payments to individuals, regardless of need. 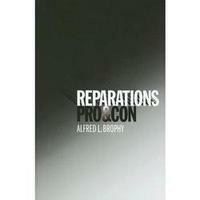 No one that I know who is a serious scholar of reparations is thinking in those terms. I think that's just a way anti-reparations writers have of making the movement look foolish. That's a discussion best left for another time. There is one place, though, where the movement has had an effect. I think talk of reparations has shifted discussion of race. President Bush's moving speech at Goree Island in 2003, where he acknowledged that we have a long way to go to incorporate everyone in the bounties that our country has to offer, is one example of rhetoric that has been shaped by the movement. So what happens now? Reparations talk has, for the better part of a decade (and at other times through our post-Civil War history), reminded us of the many ways in which some Americans have been grossly mistreated--and how that legacy is having an effect today. But that knowledge mixes in other ways with politics and morality--and perhaps, perhaps will lead to renewed calls for social-welfare programs for all people in need. As a future historian, I am very much aware of the many crimes executed upon us at the hands of Arabs, Africans, Europeans and we need to add the Jews. Many black people in today's diaspora are not aware of their (Jews) involvement in the Holocaust. According to "The Secret Relationship Between Blacks and Jews," every Jew of the 1820 census owned at least three of our ancestors. Today, their [everyone involved] apology is empty and futile. As our ancestors exact their justice upon them in the form of hurricanes, which originate off the coast of Alkebulan, later named Africa, we should smile. The majority of us live in squalor because of Anglo-Saxon continued deceptive practices in employment and true equality. The American nightmare continues. Dr. John Henrik Clarke stated it best, "the only thing we owe anyone, is a whipping."